Utah has not always been home to humankind. Before Utah was a state, before Europeans claimed the New World as theirs, before Lake Bonneville dwindled to remnants that we call the Great Salt Lake and Utah Lake, before the first Native Americans trekked to the New Continent, the American West was home to a diverse and exotic suite of animals. Early in the Tertiary Period, not long after dinosaurs became extinct, mammals began a long and colorful evolution in North and South America. By late Tertiary time, two million years ago, our continent was occupied by camels, mastodons, horses, ground sloths, armadillos, saber tooth cats, giant wolves, giant beavers, giant bears, and many other exotic animals. The landscape from a distance looked more like today’s Africa than modern North America. By the late Tertiary, glacial conditions in high latitudes intensified. Enormous quantities of water were bound up by the glaciers, and sea levels fluctuated with each shortlived glacial episode. About 1,600,000 years ago, the first mammoths emigrated to North America from Asia during one of the low stands of sea level. That event marks the arbitrarily defined beginning of the Pleistocene Epoch of the Quaternary Period. The Ice Age was in full swing. Mammoths spread throughout North America, adjusting to the native fauna, which included mastodons, their distant cousins. Like most of the other Ice Age animals, mammoths became isolated from their Eurasian ancestors in the Pleistocene. Mammoths evolved for more than 1.5 million years in North America, adjusting to the fluctuating conditions of the Ice Age. With each cycle of glaciation and deglaciation, habitats were disrupted first, then stabilized, and then disrupted again with renewed glaciation. Each time the glaciers formed, they coalesced into enormous sheets of ice over central and eastern Canada, eventually pushing southward. These ice sheets, or continental glaciers, were as thick as two miles. They often moved so rapidly that they crushed standing forests. At one site in Wisconsin, a low-elevation forest was crushed by the mountain of ice that overran the landscape; in a matter of only a few years (or perhaps, months) the elevation changed from only a few hundred feet above sea level (the elevation of the forest) to perhaps 10,000 feet at the top of the glacier, as high as the Wasatch Plateau today. Effects in the West were similar, but more localized. Glaciers waxed and waned in the mountain valleys, and fresh-water lakes filled the adjoining basins. In Utah, Big and Little Cottonwood Canyons, and many others, were gouged by glaciers hundreds of feet thick. Glacial Lake Bonneville received the waters from spring and summer melt from the glaciers. Lake Bonneville grew, submerging vast tracts of low-elevation habitat. The vast intermountain basin we know today as the Great Basin was filled with fresh water. Terrestrial vertebrates were restricted to the shorelines of that glacial lake. Habitats suitable for mammoths, mastodons, camels, horses, and muskoxen were restricted to the margins of lakes and the periphery of mountain glaciers. Large ungulates that for generations had migrated with the seasons had to move along shorelines rather than across valleys. Climatic effects during the Ice Age became drastic by the end of the Pleistocene. Populations of animals and plants that lived in Canada were pushed southward thousands of miles. 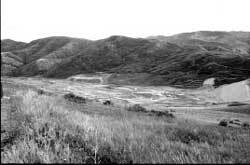 Intermountain valleys in the West became home to forests, rather than the deserts we have today. Between glacial episodes, forests retreated to higher elevations and desert vegetation returned, only to be replaced with the next glacial episode. Especially during the latter part of the Ice Age, animals and plants that lived in northern Utah left a wonderful legacy of their history. With each fluctuation of the climate, some old species returned, and some new ones appeared. 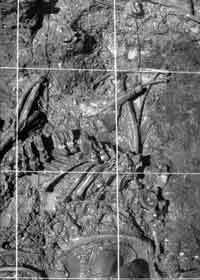 Some of those animals have been preserved as fossils in sediments deposited during their existence. This paleontological record allows us to chart a faunal history for northern Utah during the Ice Age that reflects climatic fluctuations brought about by the waxing and waning of glaciers, the rise and fall of glacial lakes such as Lake Bonneville, and modifications of vegetation zones. This fossil record, especially of the past 30,000 years of the Ice Age in Utah, expands every year with new and important discoveries. Gradually through the Ice Age, the fauna became familiar. There was a net loss of diversity: extinction took a heavy toll, ultimately removing mastodons, mammoths, camels, horses, ground sloths, giant bears, giant wolves, giant beavers, muskoxen, giant bison, and many other species. The history of emigrations, population expansions and adjustments, and ultimate extinction or survival of these Pleistocene animals are only broadly understood. We debate ultimate causes, seeking to understand broad patterns of evolutionary history of the Ice Age biota. We seek to more clearly understand the origins of the modern biota from this Pleistocene heritage, and the patterns of survival that this rich paleontological history can provide. Theories that seek to explain the Pleistocene extinction fall into two categories. According to “Pleistocene Overkill Theory,” the large animals in the Americas were killed off in a veritable blitzkrieg by early humans who entered North America from Asia. The “Climate Theory” holds that rapidly fluctuating climatic changes proved too demanding to populations of large ungulates, which became extinct for their failure to adjust; predators such as the shortface bear and saber tooth cats lost their natural prey and met extinction as well. These theories provide working hypotheses that can be tested by modern application of stratigraphy and biochronology from radiometric dates. Each new fossil site holds potential clues that add to the knowledge of these original Utah wildlife species. New discoveries of fossil vertebrates in northern Utah include several of the extinct megafauna. A nearly complete skeleton of the Colombian mammoth, Mammuthus columbi, was discovered by construction crews in Huntington Canyon, between Fairview and Huntington, in 1988. Our office (State Paleontologist, then in the Division of State History) conducted the excavation and study of that skeleton, associated plant fossils, an associated cheekbone with teeth of the giant short-faced bear Arctodus simus, and several human artifacts. 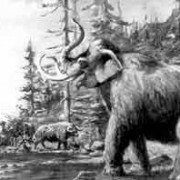 The mammoth died at a record-high elevation (9,000 feet) for the species, which is generally regarded as a plains animal. The age of this old bull was roughly 65 years, based on comparisons of dental wear in modern elephants. 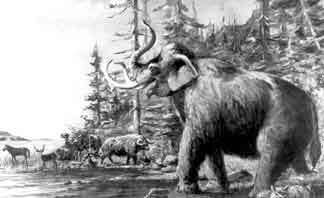 The Huntington mammoth was also one of the last mammoths to live in North America; the best radiocarbon date of roughly 11,220 14C years before present represents the very end of mammoth existence in the Americas. The bones were so perfectly preserved by the bog conditions that they retained proteins; these original organic compounds will be analyzed for genetic information, diet, and disease by colleagues at other institutions. 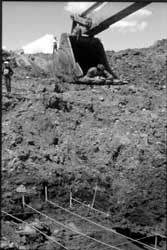 The mammoth discovery was all the more spectacular for the preservation of a set of boluses, or round mats of partially digested vegetation from its intestinal tract, giving direct evidence of the old bull’s last meal: more than half was fir needles, a decidedly poor diet for an elephant. The cause of death remains undetermined. Casts of the mammoth skeleton are on display at the the Natural History Museum of Utah in Salt Lake City, the Utah State University (USU) Eastern Prehistoric Museum in Price, and the Fairview Museum of History and Art in Fairview, and in several other museums around the world. 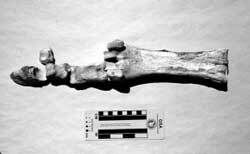 The Huntington Canyon short-faced bear found at the site is around 400 years younger than the mammoth. Dated at roughly 10,800 14C years before present, this individual was one of the last of the Pleistocene megafauna in North America, perhaps even the last generation. If this difference in age between the mammoth skeleton and the cheekbone and teeth of the bear is correct, it is possible that the bear had fed on the frozen carcass of the mammoth, like wolves do today in the Arctic on mammoths that are at least 10,000 years old. A groove in one of the mammoth’s foot bones perfectly matches the huge canine tooth of this giant bear, half again as large as modern grizzlies. Whether the groove was made by the same individual bear remains a mystery, but it is possible that the bear fed on the carcass and died at the same place. Two other mammoth sites were discovered in 1995. 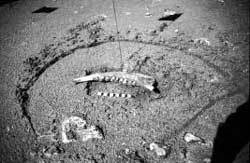 One was at Bear Lake, where the complete lower jaw of a baby mammoth was found in association with bones of a large ungulate, probably a muskoxen. The baby was only about a year old, its small teeth and jaws in marked contrast to the huge grinders of the Huntington specimen. From a site near Logan, construction workers discovered the complete tusk of an adult mammoth, about 7 feet long and nearly a foot in diameter where it fit into the tooth socket. This tusk has an unusually tight curve of almost 180°. This tusk is on display in the Geology Department at Utah State University. Muskoxen, today restricted to the high latitudes of Canada, Alaska, and Siberia, were once abundant in Utah. Two new sites have produced partial skulls of these exotic ungulates. One is from a gravel pit near the Kennecott Copper Mine west of Salt Lake City, the other from the construction site of the new Huntsman Building on campus at the University of Utah. Both were from shoreline deposits of Lake Bonneville, roughly 18,000 years old. These and other records of muskoxen in Utah seem to indicate the presence of frigid conditions in northern Utah in the not-so-distant past. However, a partial skeleton of the giant ground sloth, Megalonyx jeffersoni, named for our third President who was the first scientist to describe ground sloth bones in North America, was discovered near Provo in 1992 in a Lake Bonneville shoreline deposit. This ugly, plant-eating giant, weighing probably two tons and standing 10 feet tall at the shoulder, came from ancestors that were tropical. Halfway between the Arctic and the tropics, Utah’s megafauna in the Pleistocene is perplexing and exotic indeed. Other recent discoveries of Ice Age animals in northern Utah include camels and horses from a site near the Kennecott Copper Mine, on the east flank of the Oquirrh Mountains; and horses, mastodon, and other smaller animals at the Little Dell Reservoir in East Canyon a few miles east of Salt Lake City. The Kennecott site might be early Pleistocene in age, rather than late Pleistocene like all other Ice Age sites in northern Utah. Both sites have small rodents whose fossil jaws and teeth are a permanent record of their past existence. Because rodents evolved rapidly during the Pleistocene, their fossil remains can be used to establish approximate stratigraphic position; they are among the best index fossils we have for deciphering Pleistocene stratigraphic positions. Confirmed records of Utah’s Ice Age residents now number several dozen vertebrates, and the list is slowly growing. With each new discovery, we have the prospect of adding more details to the picture, and eventually of expanding our rudimentary understanding of the animals and people who came before us. The past is our prologue.